Nifty – Headed to 5750-5650. - > After a non stop run from 5350 to 5950 it was expected that markets should correct but it went all the way to the trendline. - > The breakout happened around the 5600-5650 mark so that now becomes an important base for the next few weeks. -> For the near term the support is at 5750 which is the trendline in blue and any further crack can take it to 5650. 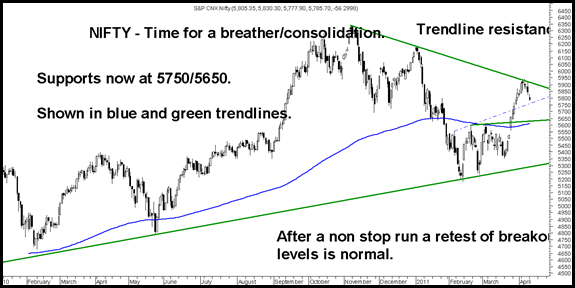 - > A dip closer to 5650 could be again a re-entry point for stock specific or a bounce back trade. We may expect the nifty range to be 5650-5950 but the action would largely be in the broader market. What is the returns u expect in share bazaar in 2011 ?